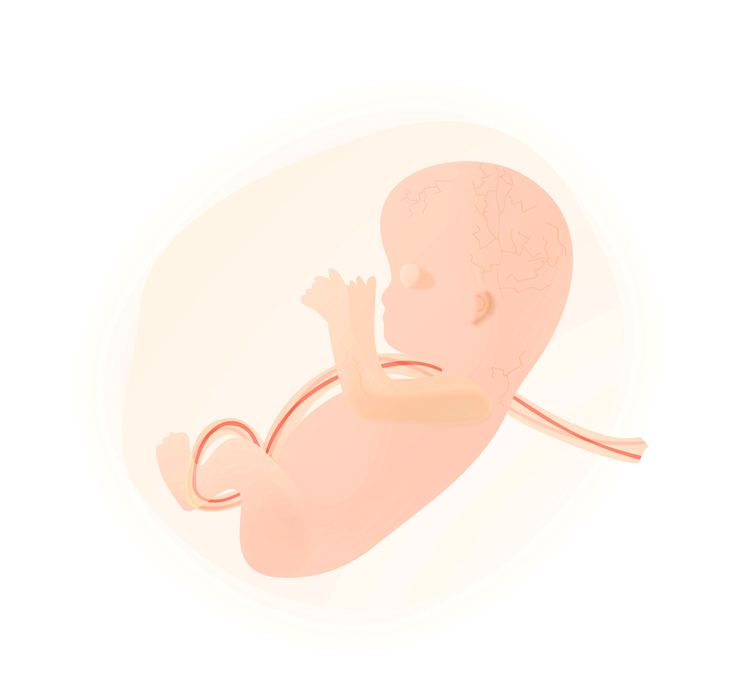 Throughout pregnancy, the umbilical cord nourishes the unborn baby with blood rich in nutrients and oxygen. The blood that remains in the cord and placenta after birth is full of stem cells. These cells are like the blood-forming stem cells that can be collected from the bone marrow or circulating blood of adults. Transplantation with blood-forming stem cells can help save the lives of people with blood cancers or diseases like aplastic anemia. For these transplants to be successful, the donor must be very carefully matched with the recipient. Even with a registry of diverse donors like Canadian Blood Services’ OneMatch, which has connections to millions of donors worldwide, many Canadian patients are not able to find a suitable stem cell donor. That’s where cord blood comes in. The stem cells in cord blood are immature, which means they do not need to be matched as closely with the patient. Cord blood is collected and stored ahead of time, so it is available for immediate transplantation. On the other hand, storing cord blood is costly and the number of stem cells in each cord blood unit is low, which can make it harder for the transplant to succeed. Canadian Blood Services’ National Cord Blood Bank collects cord blood at hospitals in four Canadian cities (Ottawa, Brampton, Edmonton and Vancouver) and prepares it for frozen storage. Banked cord blood must meet strict quality standards to ensure that it is both safe and effective. What happens if the cord blood collected by Canadian Blood Services doesn't meet those standards? 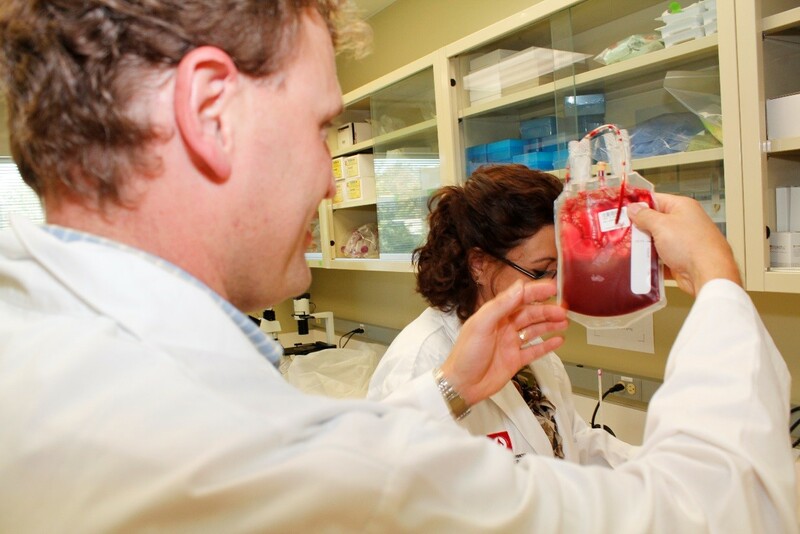 To avoid discarding the precious donated cord blood, Canadian Blood Services has a Cord Blood for Research program. To learn more, I sat down with Dr. Mia Golder, manager of research and training programs and the former coordinator of the Cord Blood for Research program. What is the Cord Blood for Research program? Launched in August 2014, it is a partnership between Canadian Blood Services and The Ottawa Hospital. Cord blood units that are not suitable for banking are provided, with mothers’ consent, to investigators that pursue approved discovery or development research. Since its inception, the program has distributed more than 400 fresh cord blood units collected at The Ottawa Hospital to researchers. In the absence of the program, these fresh cord blood units that did not meet the initial criteria for storage in the Cord Blood Bank were discarded. What’s new with the program? Starting in November 2016, we are also distributing frozen cord blood units. These units have met the initial criteria for storage in the Cord Blood Bank and are processed to be banked for future transplantation. However, during the manufacturing process, the units fail to meet all of the quality criteria so they cannot be banked. Instead of discarding these units, we are now offering them to researchers. For a detailed description of these cord blood units, please see the product specifications sheet. What types of research does this program support? Our goal is to facilitate research that promotes advances in the fields of transfusion, cellular therapies, and transplantation medicine in Canada. Some of the projects we support are investigating ways to improve current cord blood use. For example, investigators are exploring ways to grow more blood-forming stem cells to optimize cord blood transplantation. Others are investigating new regenerative therapies such as using stem cells in cord blood to treat cardiovascular diseases. Others are using those precious cord blood samples for fundamental research that may one day lead to better therapies for acute myeloid leukemia or other diseases. To learn more about the types of research projects that are supported by the Cord Blood for Research Program, check out the project summaries here. What is the research impact of this program … and ultimately how might it improve patient care? It is difficult for researchers to obtain cord blood if they are not associated with a hospital or if processes are not in place to facilitate the donation of cord blood. Relying on processes in place through the cord blood bank, this program makes it easier for researchers to get high quality and ethically sourced research samples for their projects. 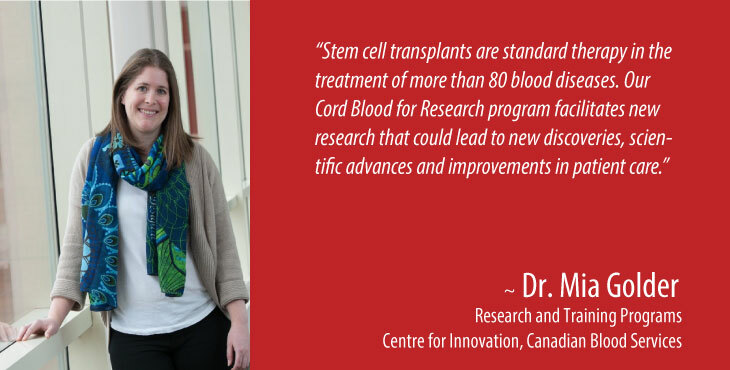 By providing cord blood products to Canadian researchers, the Cord Blood for Research Program has the potential to generate improvements in cord blood banking and (or) transplant processes that would increase the clinical utility of cord blood. The research supported through our program may also lead to the development of new therapies that could eventually be used to treat patients. All of this is made possible by the generous gift of cord blood donors! We thank all the mothers who consent to donate their child’s cord blood for research. How do researchers go about requesting cord blood? To request cord blood products (fresh or frozen), researchers must follow a few simple steps. The whole process generally takes about six weeks from receiving the application to approving the project. It starts with the researcher applying to Canadian Blood Services and it ends with the completion of a material transfer agreement between the researcher and Canadian Blood Services. See the detailed process here. How do mothers go about donating their baby’s cord blood for lifesaving transplantation or research? It’s really easy! First, read the information kit. Then fill out the forms and give them to your healthcare providers on your delivery day or at one of your prenatal visits. If you are in Ottawa, make sure you tick the box that says “Research Opt-In” at the end of the form. That’s it — your medical staff and Canadian Blood Services will take care of the rest. If you would like to learn about research projects supported by this program, read more here. If you are looking for more information about donating cord blood, read more here. Through discovery, development and applied research, Canadian Blood Services drives world-class innovation in blood transfusion, cellular therapy and transplantation—bringing clarity and insight to an increasingly complex healthcare future. Our dedicated research team and extended network of partners engage in exploratory and applied research to create new knowledge, inform and enhance best practices, contribute to the development of new services and technologies, and build capacity through training and collaboration. The opinions reflected in this post are those of the author and do not necessarily reflect the opinions of Canadian Blood Services nor do they reflect the views of Health Canada or any other funding agency. On that front, Canada is doing a very good job. Dr. David Allan, medical director for Canadian Blood Services’ Cord Blood Bank and OneMatch Stem Cell and Marrow Network, reports that more than 1,000 units of cord blood are now available in the public Cord Blood Bank.